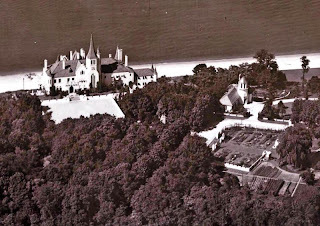 An aerial of 'Beacon Towers', the Alva Vanderbilt Belmont estate designed by Hunt & Hunt c. 1917 in Sands Point. Click HERE and HERE for more on 'Beacon Towers'. Photo from The Vanderbilt Cup Races. I assume that the gatehouse is the small building to the right. Does anyone know if the gardens pictured to the left of it were part of the property? 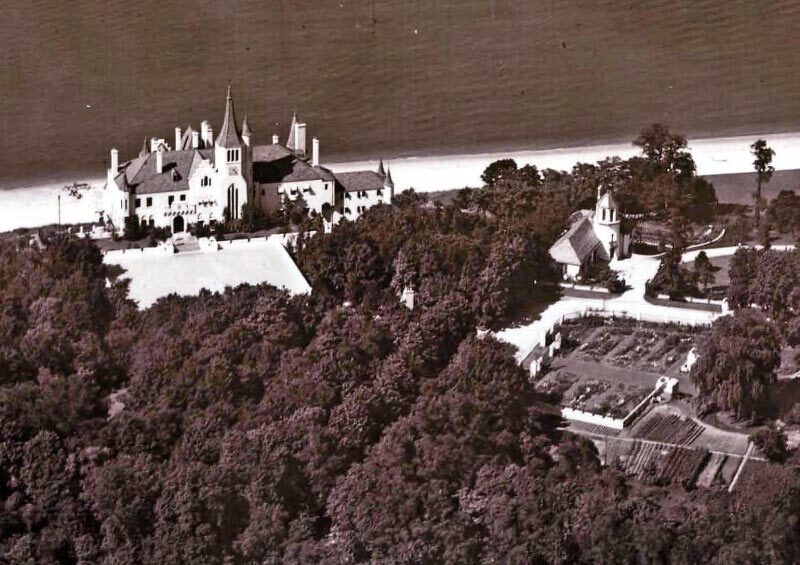 My guess is that like any self respecting estate of its era, the property boasted the requisite vegetable gardens, cutting gardens and greenhouses, but I have never seen them pictured. The building on the right is the garage ~ the chimney of the Gatehouse is just visible in the very center of the photo. That would be the public road that takes a turn. I'm thinking that the gardens visible are part of anoather property across the road. Surely someone will be able to identify the property in another comment. A fantastic aerial view of the full entrance area plus the mansion itself. The gardens should belong to Beacon Towers as the walls and wonderful ironwork details all match on both sides of the road, plus it is a great idea to view a garden as one is departing from the property throuogh the gatehouse. The garden area today has been developed as an actual entrance drive leading to a new house. Great photo. Thank you, Archibuff ~ I see it now ! The inner, battlemented, garden walls and garden 'houses' echo that which flanks the front steps of Beacon Towers itself ! And, YES, it makes a wonderful vista for anyone leaving the property by the main gates. Thanks for pointing it out ! There is an interesting clip from CBS News that showcases an architectural team who are building buildings in NYC with old materials in old styles. They predict that this is the wave of the future- a renewed appreciation for what everyone who loves this site aoppreciates. Let's hope so. wowza! What a place. Love love love it! Crazy place, find it more as an amusement than a home. Wow Zack great find!!! thanks so much! I just saw this... lovely!